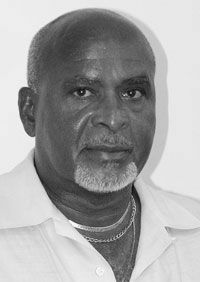 Williams explained that on the morning of Saturday, November 8, he was in Randyâs Supermarket (Lower Bay Street) when he noticed a fracas between the storeâs security guard and a man reputed to be a vagrant. The man was physically removed from the store but later returned, intent on revenge. Williams, an Upper Sion Hill resident, recalled that he was at the cashierâs till when he saw people running away from the supermarketâs entrance. Apparently, the vagrant had re-appeared with a concrete block, which he promptly hurled towards the establishment. Fortunately for the supermarket owner, the block did not strike the property. However, Williams was not so lucky. âHe (the vagrant) tossed the concrete block towards the supermarket but it never entered. It was blocked by my vehicle!â Williams related. The vagrant then ran off towards the Rose Place area. The damage to his vehicle, a silver Toyota mini-van, will set back Williams $500 – a bill he will have to foot himself. In this current climate of financial difficulty, it is a tidy sum. âThe expense of repairing my vehicle is mine,â he lamented. He praised the police for responding promptly to the scene and investigating the matter immediately. On Monday, November 10, he was summoned to the police barracks to identify a suspect they had detained. However, the suspect was not the person who had damaged his car, so the hunt continues.